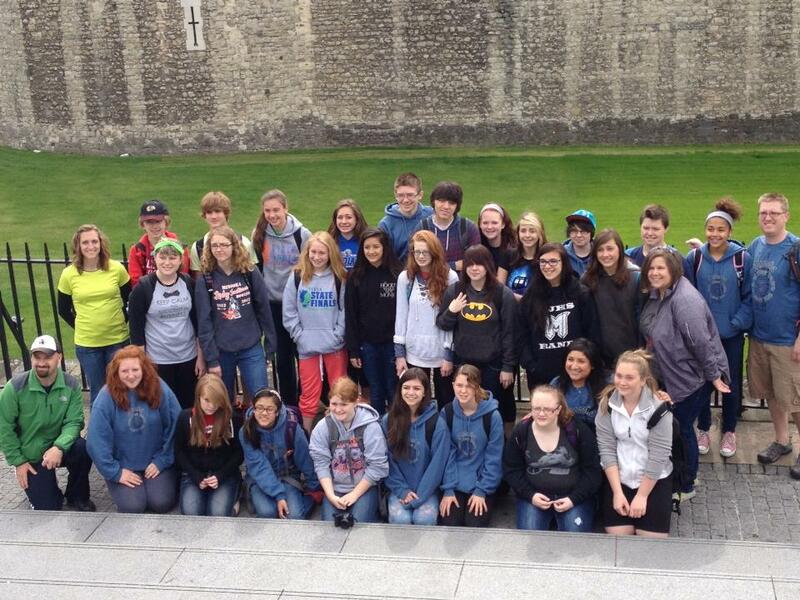 The TAP gang hanging out in front of the Tower of London. Our trip to England in 2013 was our seventh adventure, but the experience was full of seconds. If you’ve read about our other trips, we’ve talked all about the firsts, and England 2013 had plenty of those too, but what’s really interesting is all the seconds. This trip was a homecoming of sorts for Mr. Curtis. He spent a year of college living in northern England, traveling all over the country and seeing many of the places we visited on this tour. On top of that, because of our accidental visit to London back in 2008, it was the first time TAP made a return trip to a city. Read about that adventure here. And, the Tour Director that showed us all that England had to offer was Lorna, the same TD we had for our Ireland trip back in 2010. It was also the second time that one of the TAP teachers brought along their spouse. Mr. Harig returned for another tour (he previously went to Spain with us) and Mrs. Curtis fulfilled her lifelong dream of traveling around the world with a group of 8th graders. (Actually, her lifelong dream was to visit London, but we were trying to make the 8th graders feel more special and loved). In June 2013, Mr. Curtis, Mrs. Harig, Miss Lara, Mr. Doerr, and Miss Tadey took 28 students and a handful of parents and grandparents (and Mr. Harig and Mrs. Curtis) on an incredible trek around England and Wales. 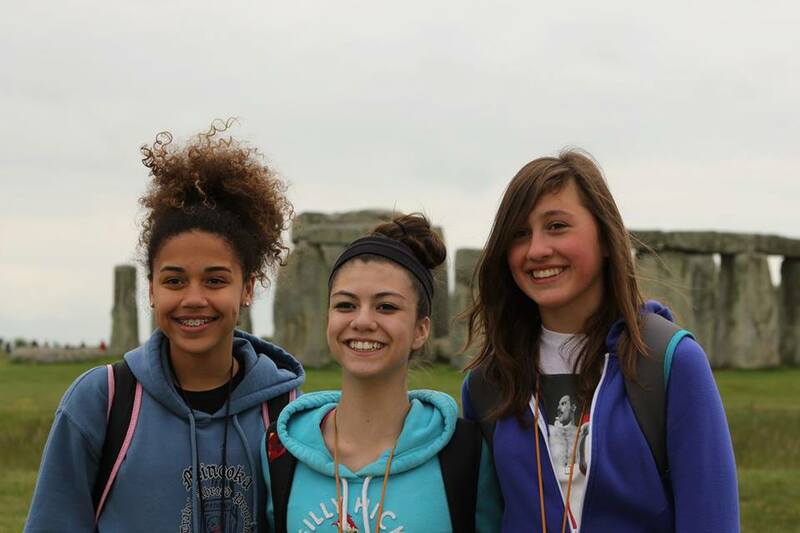 They learned about ancient history, literature, theatre, World War II, Medieval times, and the Renaissance while visiting places like London, Dover, Bath, Stonehenge, Stratford, Snowdonia, York, and Nottingham. 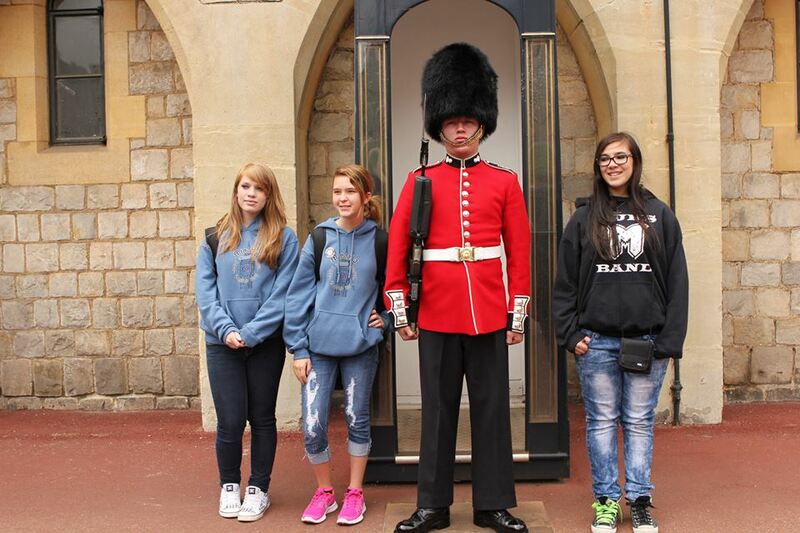 When you’re in England, some times you have to pose for some of the touristy pictures. You just have to. The trip began in London, and since our itinerary took us in a big loop around the country, it would end in London too. Most of those first few days in London were a big tease. We saw all the cool sites, but didn’t actually go inside many of them yet. That had to wait until later. We started out with a crazy city guide named Jan, who was absolutely hilarious. She took us on a whirlwind bus tour of all the major sights, highlighted by a stop at Buckingham Palace just in time for the changing of the guards. Jan was a pro, so she knew exactly what time to get there and where to position our group so we’d see the guards change, then be able to follow them as they marched with the full military band, down the street to the barracks. That was quite an experience. Then we visited Westminster Abbey, highlighted by checking all the famous names in Poet’s Corner. Outside of the Abbey, we sat and ate our lunch in a small square, looking up at the Big Ben Tower just a few blocks away as we tossed bread to the pigeons. It was only halfway through our first day and we’d already seen many of the things we’d been waiting years to see. The next morning we headed out of London for a day trip to Dover and Canterbury. Of course we’d read all about Dover’s White Cliffs, but the star of that day was Dover Castle. We knew there were going to be tons of castles to visit on this trip, but Dover was the first (and wound up being many people’s favorite), so that was something special. In Canterbury we visited the Cathedral and a small museum filled with actors and animatronic dummies that told the story of Geoffery Chaucer’s The Canterbury Tales. Canterbury also allowed us a little bit of free time to wander around and eat lunch. Some of us were already dying to try some authentic English fish and chips, so we split into smaller groups and found some lunch. Even those of us who don’t like fish at home enjoyed the fried pieces of whitefish, the crisp breading, and the salt and malt vinegar you pour over your food. Just thinking about it makes me want to go back to that same little chip shop right now. On the way back towards London, we visited one of the oldest sites we’d see on the tour – the Richborough Roman Fort. There isn’t much fort left, but the foundation of an enormous military structure that was built during the Roman occupation of the island was still there. We were given hand held audio guides that plugged into our headphones and took the time to lead ourselves around the site, learning all about the Romans as well as about the archaeologists that uncovered the fort. Another day trip out of London the following morning took us to Windsor. There we toured the palace and actually got a look at the Queen of England’s dogs as some lady took them for a walk. We each got to take a moment to get our pictures taken with one of the palace guards, and I even got him to talk to me a little bit. One of the Wonders of the World – Stonehenge – was next on our list, so a long bus ride out of the city, through the English countryside, and to one of the coolest places I’ve ever been. Stonehenge is full of mystery, because no one knows for sure how or when or why it was built. Our day guide, Barry, did his best to present us with some theories about the ancient stone structure, and as we walked around all of us tried to imagine what it was like there thousands of years ago. After Stonehenge, Barry took us to Bath where we saw the ancient Roman Bath Houses, Bath Cathedral, and Jane Austen’s home. The highlight of Bath was trying some traditional Cornish food (Bath is in a region of the country called Cornwall) starting with a Cornish pasty, which was sort of like a British Hot Pocket. Then we tried Bath buns, these enormous sweet bread rolls that the town is famous for. Both were fantastic. Our next stop was Warwick and its huge medieval castle. Warwick Castle is one of the best preserved castles on the island, so it gave us a great look at what life would have been like in the 18oos all the way back to the 1000’s! Warwick was first started in 1066 and continued as a working castle for over 800 years. Over time the place grew and changed, but today it’s like a time line of English history that you can walk through. While we were there we saw the towers, the dungeons, the armory, the stables, and just about everything else including demonstrations on falconry and the trebuchet. 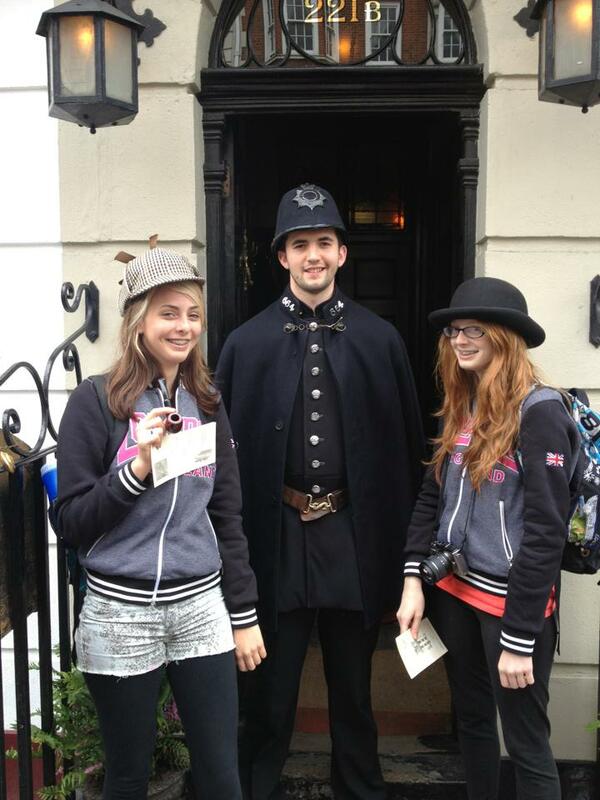 Outside 221b Baker Street, you could dress up like Holmes and Watson. Later that day, in Stratford-upon-Avon, we visited all things Shakespeare. We saw his birthplace, his wife’s home, the site of his former home, his daughter’s house, his school, his church and grave, and of course his theatre. Stratford was just an unbelievably cool town to walk around in. Everywhere you went there was something related to Shakespeare and his life. Shops and restaurants had silly names filled with Shakespeare related puns, there were statues of the Bard and his characters all over the place, and every so often you’d run into someone performing his plays and poems out on the street or in a park. The day was highlighted by a visit to the Royal Shakespeare Theatre to see one of his comedies, As You Like It. I think the kids, and most of the adults, were a little wary and nervous about seeing the play – especially the language, but the company did a great job modernizing the story just enough that it appealed to the younger audience. By intermission, the whole group was riveted, and by the end of the night, Shakespeare had a bus load of new fans. To top it off, after the show, as we were piling on to our bus, one of the actors from the play was on his way out of the theatre and climbed aboard the bus to thank us all for coming and being such a great audience. That up close and personal experience just added to the magic of our Shakespearean day. We added a second country to our trip by traveling north into Wales the following morning. We had a long bus ride up through the Welsh mountains, but the scenery was so beautiful no one minded. We made a few stops to take closer looks at some Welsh castles, which were built a bit differently from the ones we’d visited in England. Our final destination was Snowdonia National Park and a slate mine. At the slate mine we took a small train/elevator thing to go down into the mine, twelve stories beneath the surface. While we were down there, we hiked around underground, learning about the mine, slate, and the men that worked down there. The tour wound up at a beautiful underground lake and a train ride through the mountain into other sections of the mine. Then we saw a demonstration on how the slate is cut into things like roofing tiles, picture frames, and coasters. Overall, it was an incredibly informative day and a fantastic experience. The former Viking settlement, York was next. We traveled across the northern part of the country and had time to see the Jorvik Viking Museum, that transported us back in time to when York was a Viking village. Then we visited York Castle, which has been turned into a really cool museum about British history. Inside you can walk through recreations of small English villages from different eras. Finally, we walked along the top of the medieval city walls to get to York Minster – one of the most incredible churches TAP has ever visited. 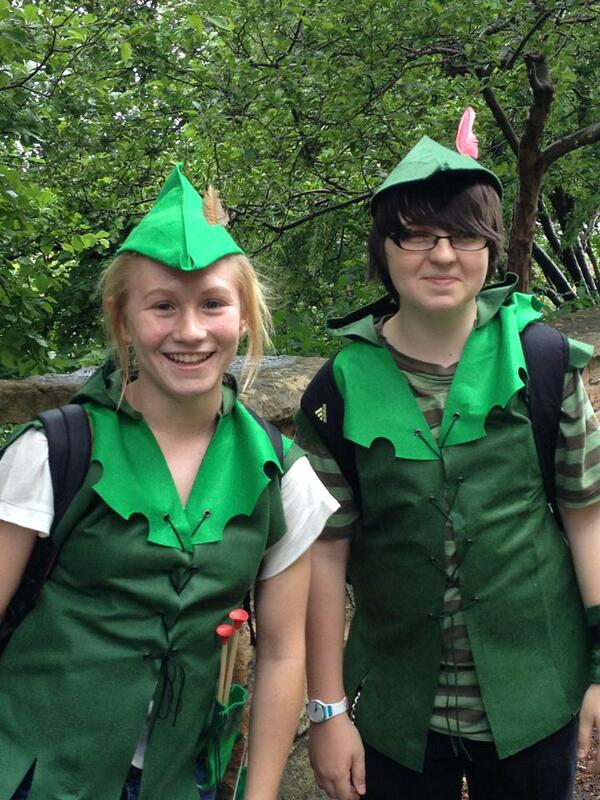 Some of us really got into the idea of playing Robin Hood in Sherwood Forest. After York, we began to make our way south again, completing our loop around Great Britain. On the way down, we made one of the most fun stops we’ve ever made – Sherwood Forest and Nottingham. The legend of Robin Hood was on all of our minds when we were hiking through Sherwood. We watched a video about Robin’s legacy first, then took a stroll through the woods, some of us pretending Prince John and the Sheriff of Nottingham were after us as we went. Before visiting Nottingham Castle, we stopped for lunch at one of my all time favorite restaurants in TAP history. Nottingham Castle is built on top of a huge rock in the center of town, and the The Ye Olde Trip to Jerusalem Inn was built into the base of that rock, with it’s brewery and storehouse actually beneath the inn in a series of caves. The inn was first opened in 1189 as a brewhouse for the castle, and kegs of beer were hauled up out of the inn’s ceiling, along the castle walls, and into the courtyard. We ate a great lunch there, but also got to tour the tunnels beneath the place, seeing how the beer is made, hearing the ghost stories, and getting to try on some old fashioned armor. Not a bad experience considering all we were supposed to do is get a sandwich. We’d finally made it all the way back to London for the last few days of our English adventure. There we rode the London Eye, toured the Tower of London, went to the top of the Tower Bridge, and saw the homes of Sherlock Holmes and Charles Dickens. We saw another Shakespeare play – this one in the Globe Theatre, an outdoor, circular space modeled after the original Globe from the 16oos. This one was The Tempest, and some of us liked even better than the show we saw in Stratford. One of the best parts of the adventure was when we climbed to the top of St. Paul’s Cathedral. St’ Paul’s is the second largest church in the world – making it so TAP has visited the three biggest now — St. Peter’s in Vatican City and Seville Cathedral in Spain. By the end of the trip, I think many of us had fallen in love with English life. From the hustle and bustle of London – filled with cultural and historical places of wonder – to the small towns and villages like Coventry, Bath, and Stratford – that were filled with friendly people with stories to tell. I know this was the first trip to England for most of the group, but I’d be willing to bet that for most of them it won’t be the last. There’s something about the place that draws you back again and again. I can’t wait til I can go one more time.